‘He suggested that we choose one the civil service’s five standard excuses. Humphrey must be quite anxious about the situation if he’s prepared to reveal his techniques to me so openly. I made notes. I have called each excuse by the by the name of a famous example of its use. It occurred before important facts were known, and cannot happen again. Stendhal syndrome is named after French author Henri-Marie Beyle (1783-1842), whose penname was Stendhal. It refers to the symptoms experienced by a person who has been exposed to a work of art that is so beautiful or overwhelming that it causes an increased heartrate, dizziness, fainting and even hallucinations. Beyle himself experienced these symptoms while visiting Florence in 1817. The name Stendhal syndrome was first given to these symptoms by Italian psychiatrist Graziella Magherini in 1979, who described more than 100 similar cases among tourists and visitors in Florence in her essay La Sindrome di Stendhal (1989). Especially the Florentine Uffizi museum appears to be a significant cause of these psychological and physiological manifestations. Stendhal syndrome is also called hyperkulturemia or Florence syndrome. New psychological research suggests that soccer goalkeepers and teams are not only affected by the high-stakes pressure of a penalty shootout. Without their awareness, goalkeepers also appear to be biased to dive to the right in some situations. The consequences of this bias could potentially affect games ranging from casual pickup matches to world championships. The bias primarily seems to affect goalkeepers when their teams are down, according to psychologists at the University of Amsterdam. A number of psychologists at that particular university believe the bias likely extends to other sports as well that involve rapid decision-making under pressure. The researchers said their hypothesis arose from a discussion they had with each other at a bar one Friday evening. They were talking about two recent papers. One showed dogs tend to wag their tails to the right when approaching their masters. The other showed that soccer goalies have a tendency to dive one way or another while facing penalty kicks – they seem to dislike staying still. The psychologists in question started examining the evidence. They looked at penalty kicks in the men’s World Cup football championship from 1982 onward and found 204 penalty shootouts. When teams were tied, they found that goalkeepers dived left and right equally. But when their teams were down, the psychologists found goalkeepers were more than twice as likely to dive right as dive left. Now, there’s a scientific explanation for this – and it doesn’t have anything to do with being left-handed or right-handed. Among humans, dogs and some other animals, individuals unconsciously move to the right when they approach something they really want. Lovers tend to lean their heads to the right when they kiss; dogs wag their tails to the right when their masters approach. The predisposition to go one way rather than another does not mean that individuals always have to go that way. But it does mean they have an unconscious tendency to favour one side rather than another in certain situations. The Amsterdam University psychologists said the tendency likely arose in different species because there was an evolutionary advantage for many members of a given species to favour one direction rather than another – when they were hunting or avoiding predators, for example. 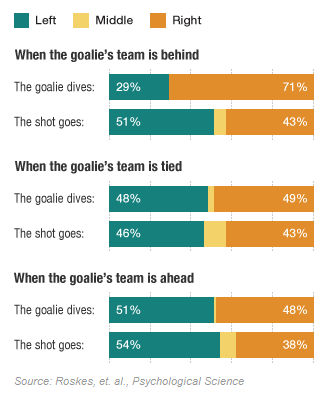 Note also that the research showed that when the goalie’s team is behind, the goalie never remains standing in the middle of the goal, but instead, chooses to dive either left or right. Thigmotropism is a natural property that can be found in plants. The word is derived from the Greek prefix thigmo-, meaning touch, with -tropism meaning movement. Thigmotropism entails the moving or growing of an organism in response to touch. When thigmotropic plants grow around or against a surface, the plant’s tendrils will either coil around or stick to it. Climbing plants such as ivy and vines are an example of this. When the tendrils touch the surface, the cells on the opposite side will elongate, while the cells on the touched side will shrink, causing the tendril to bend. Carnivorous plants are thigmotropic – when an insects flies into their trap, the touch leads to the plant closing its leaves or tentacles to consume the insect. When plants grow towards the touched object, they are positively thigmotropic. Some plants, however, have roots that are negatively thigmotropic – the roots instead grow away from objects in the ground, so as to grow more freely. Thigmotropism in this case overrides gravitropism – movement and growth influenced by gravity – causing the roots to be able to grow upwards if necessary. Some insects can be thigmotropic as well. The earwig is thigmotropic, which means it likes touch and will try to creep into tight spaces all the time. Although the assumption that earwigs get into people’s ears is largely an urban myth, their thigmotropism does cause them to crawl across human skin more than non-thigmotropic insects. The urban myth that a ship’s captain cannot marry people was invented by the film industry. The urban myth that lemmings jump over cliffs was invented by a 1905 children’s encyclopaedia. Caravaggio’s real name was Michelangelo. The steam engine was invented by Hero of Alexandria, and was named the Aeolipile. The railway was invented seven hundred years earlier by Periander of Corinth. 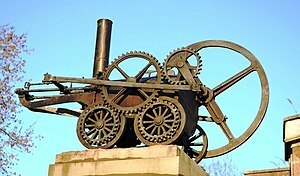 The modern steam engine was invented by Richard Trevithick. When Stephenson’s Rocket was introduced, people were concerned that travelling at such high speeds could cause irreparable brain damage.